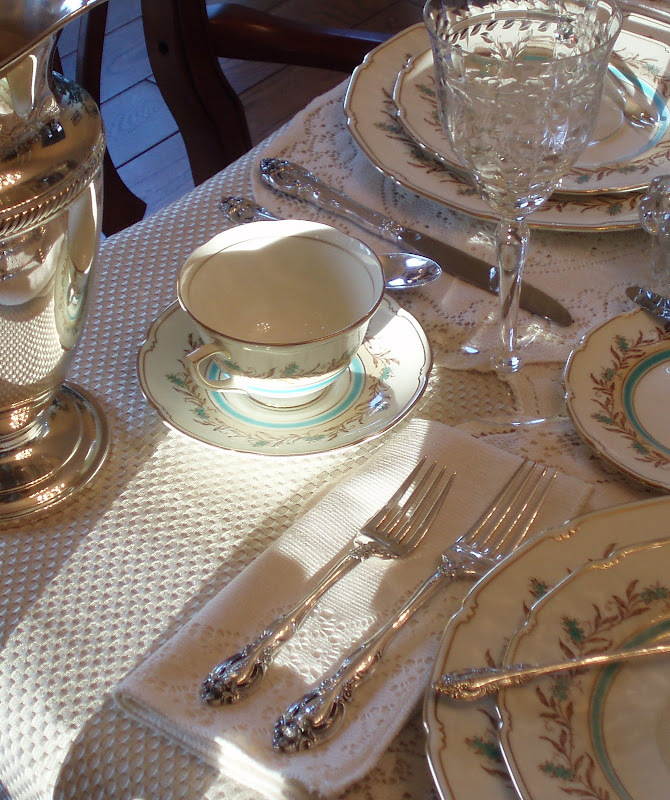 Affordable Accoutrements: Appreciation Dinner, with Coronation! It's Thanksgiving and, in considering the things for which I am thankful, I thought of how kind and generous people have been since Affordable Accoutrements began. Rather than a traditional Thanksgiving meal, I decided to host a (virtual) appreciation dinner ... with coronation (more on that later). If the tablescaping community has a queen (and we know that we do ... Susan of Between Naps on the Porch! ), perhaps we should also have a patron saint. My recommendation would be Hyacinth Bucket of the classic British situation comedy, "Keeping Up Appearances." Mrs. Bucket insisted her surname should be pronounced bou-quet. "It's French," she would say "but not TOO French." She had her faults, certainly, including being a social climber and a bit of a snob (particularly with regard to certain of her less upwardly-mobile relatives). However, the lady knew the importance of setting a proper table. Not just a proper table, but a spectacular one! I think of her sometimes as I'm preparing for Tablescape Thursdays ... remembering the episode in which Hyacinth explained to her henpecked husband, Richard, and to her long-suffering neighbor, Elizabeth, the reaction she expected of guests at her "executive candlelight suppers" (for which she was legendary ... in her own mind). She hoped ... expected ... no, demanded that guests, upon seeing her lavish table settings exclaim, "Oh, Hyacinth!" and stagger backward a step or two. Now isn't that the sort of reaction we all secretly desire??? What does Hyacinth Bucket have to do with this post? I thought of a coronation ... then of British royalty (since we Americans have none to call our own) ... and then of Royal Doulton ... and of Mrs. Bucket, who was forever rhapsodizing about her "Royal Doulton, with the hand painted periwinkles." I'm using Royal Doulton china this evening, but not with periwinkles. The pattern is "Prelude," and it was produced from 1940-1960. It was recently acquired at a local estate sale. Now that the leaves have fallen, light pours into the dining room in late afternoon. The silverplated water pitcher is another estate sale purchase. Here's a closer view of the china pattern. The reflection in the cup is from the chandelier above. The sterling flatware is by Gorham, and the pattern is "La Scala." It's from an estate sale (supplemented by various extra pieces purchased on eBay). It was introduced in 1964 and is still in production. The crystal is from a recent estate sale (is this becoming redundant?). If you've visited before, you'll know I don't often say "pattern unknown." I think it's probably by Bryce Brothers, based on the shape of the hand-blown bowl and of the stem. You can read about the company here. If you happen to recognize this pattern, please let me know! I layered cotton lace placemats over a Quaker lace tablecloth, placed diagonally over a larger beige tablecloth. The napkins, placemats, and lace cloth came from estate sales. The other cloth is from Ross (I do buy new items ... once in a while!). The red-tipped yellow roses are from the supermarket. Full price this time! It's a special occasion ... but they only set me back $12.99. I wanted them to open quickly, so I blew into the partially-closed buds and pulled them apart slightly with my fingers (roses are tougher than they look!). The first guest is Rettabug of The Gazebo House. Rett was kind enough to link one of my posts to Tablescape Thursday for me while I was out of town. She linked mine first ... before she added her own. Now that's friendship! Thank you, Rett. And here's Lori, of Family Trees May Contain Nuts. When I mentioned in a post that I collect "Claudia" crystal, she sent me some adorable cordial glasses. More importantly, Lori figured out why my new posts weren't appearing in reading lists of my followers and helped me correct the problem. Thank you, Lori! A place is set for Carol of Serendipity. Carol sent me extra cups from the Lenox "Essex Maroon" china she'd selected as a bride. She noticed I'd used "Essex" in a post and wanted the beautiful cups "to have a good home." Thank you, Carol, for your kind generosity. All the way from Australia, we have Coty from Styling by Coty Farquhar! If you haven't visited Coty's blog, you really must do so right away. Her work is stunningly beautiful! I was deeply honored when she suggested that her readers in Australia needed to check out Affordable Accoutrements, alongside two California bloggers, Julio's Beaux Monde Designs and Once in a Blue Moon. Thank you, Coty, for placing me in such excellent company! A place is also set for Marty of A Stroll Thru Life, one of the very nicest people around. Marty invited me to participate in a cloche party. HERE's the post I did for it. Prior to that I thought a cloche was a hat! Thank you for the education, Marty, and for being so thoughtful and affirming in your comments to everyone in the tablescaping community. Marty's next cloche party is December 4th. What's that I see in the upper right corner of the photograph below? Could it be a tiara? Or two ... and a robe befitting a royal personage? The flowers practically arrange themselves in this vintage carnation vase (yes, from an estate sale). In case you're wondering, I'd keep the flowers much lower if this were an actual dinner party ... or very high in a tall, tall container. These would definitely interfere with one's view of the other dinner guests. I polished some silverplated serving pieces in honor of the occasion. These can often be found for very reasonable prices at estate sales and thrift stores. I find polishing silver relaxing and enjoy the instant gratification. It seems that I'm in the minority ... what about you? Do you find it fun? Or an unpleasant chore? We have to have candlelight, don't we? I couldn't forget Sherry of Country Wings in Phoenix. She gave me my very first blogging award. I reluctantly decided to go "award free" due to having limited time for blogging, but that first one was such a thrill! Thank you, Sherry. Your "country hugs and love" mean so much! The placecard holders were an estate sale bargain, but they're not old. They're probably the type available online from wedding suppliers. I think they're set with real diamonds, don't you? After all, they cost me fifty cents apiece! I do like the way Royal Doulton looks by candlelight. That Hyacinth knew a thing or two about selecting suitable "ingredients" for tablescaping (long before we had a word for it!). I was one of the bloggers she included in her Halloween poem, "Witches' Flyby" HERE. What fun! Thank you, Kathleen! And of more china and crystal waiting to be part of an upcoming Tablescape Thursday. I hope no one interprets this as a request for gifts! In fact, I'm making plans for my first giveaway (coming soon!). If you liked this concept, let me know. I'll start working on the next guest list. I've already thought of several of you who have mentioned Affordable Accoutrements in posts and encouraged your readers to stop by for a visit. Many of you always leave thoughtful, encouraging (sometimes hilarious) comments. I know you'd make delightful dinner guests. Don't forget to stop by Between Naps on the Porch for Tablescape Thursday! Oh My Goodness!! This is stunning!!! And that robe!!!! Gorgeous!! We need to get you featured in a magazine my friend because you ARE magazine worthy!! Just beautiful! Hope you have a wonderful Thanksgiving!! You are sooooo gracious and I love your blog ! Thank you so much for including me in this wonderful event. Keeping up Appearances is truly a wonderful show and Hyacinth, of course, is a study. If you have not read Tuscany for Beginners by Imoges Edwards-Jones you should. It is a quick read and you will meet another lovely Brit with airs. Congratulations on your "blog Of note" recognition - very much deserved. Have a wonderful Tanksgiving. I knew it wasn't just your tablescapes that gave me the feeling of instant kinship with you... now I know it is that you are a fellow fan of Hyacinth Buc-ket and all her wonderful antics. The table looks beautiful. So beautiful you'd hate to mess it with food. I'd be happy to eat off the day dishes in a corner of the room so I could just admire ;-). What a fun party, Bill! That china is so delicate and beautiful. I love all the silver pieces as well. FYI, this is my 4th attempt to post a comment. However, I can now seem my name is the box that says "Comment as:" which tells me I'm being recognized. Sorry for the non-alcoholic whine Bill. Just had to get that off my chest. Anyway, I just wanted to say how moved I was by this post. You're thoughtfulness is inspiring. Adding to that, your remarkable talent for setting tables and story telling makes you an exceptional gentleman. You couldn't have selected a finer group of individuals to join you at this 5 star table. Her royal majesty Susan is deserving of her title and I know she will be very pleased and honor. I consider you my friend, an ambassador to this royal court of tableau reprenant dignitaries. Thank you for the compliment. Wow. To be included in this group of fine ladies and to be at one of your tables is a great honor Bill. Thank you. If we were to do this in person I know the glasses would rattle from the laughter in the room. Nice post and how appropriate for Thanksgiving ---you give your thanks for bloggers along the way. Have a nice Thanksgiving. Bill...what a fun, fun post! You are such a love to mention sooo many dear hearts out here in Blogland. But we need about 500 tiaras because each week there are MANY Tablescaping Queens and King out here...I know because I see their beautiful tablescapes every Thursday! :-) Your tablescape is gorgeous...I am seriously in love with your china and crystal. There really is nothing like the vintage pieces, is there? Your sterling is fabulous...where have you been hiding that?!!! You were holding out on us. :-) AND I had no idea you were a Hyacinth fan...shew completely cracks me up! I love her crazy brother and SIL who are always embarrassing her. And the mailman who avoids her like the plague is always hilarious! I'll tell you another Hyacynth fan out here in blogland is Miss Janice...she did a post about her and the show several months ago. Oh...there are some interviews of her and her Richard on Youtube, I believe...have you found those...they are fun to watch. To Bill who knows just how to dish! Hope it's fun. Loved this post. The red robe is awesome. What fun such a dinner party like this would be, too! I can hear all the voices in my mind & just imagine the excitement of meeting everyone. We'd all be turning the plates over to check for identifying marks & comparing our collections. Your Royal Doulton "Prelude" is sublime & I am totally enamored with the Gorham "La Scala" flatware. Outstanding!! Your blog is a captivating source of enchantment & pleasure, Bill & you have a magnificent talent for creating glowing scenes of splendor. I am very thankful for our Queen Susan & her Tablescape Thursdays & want to wish everyone a "Happy Thanksgiving" especially you, Bill! What a pretty post. You do such a good job of making us feel like we're all really there! Wow, that china is absolutely beautiful! How many sets of china do you own... I don't have any, zip, zero. So pretty amazingingly enchanting. I see even mice are following you now. Hoping for some crumbs from that pretty table. Thank you so much on your comment from my French Kissed post. What a lovely table. I have very limited experience with polishing silver, however I don't mind buffing up my flatware with baking soda to eliminate tea and coffee stains...does that count? I'm sure Hyacinth would have something to say about that lol!!! Found you blog via Blogs of Note. My blog is featured there as well (b.vikki vintage). I love Love LOVE this post. I am still crying, I told my husband Andrew about your beautiful tablesetting and I couldn't stop crying. I think you have created the most wonderful setting, it looks amazing and I love all you special touches, I always do! But, the most amazing thing that you have done this week is to spread such happiness and love around. I am honoured to be a guest at your table Bill with you and all these fantastic people. I truly wish for you a wonderful Thanksgiving and I am so glad that I found you through our beautiful Susan. What a fantastic dinner party it would be, I really wish I could be there. A truly splendid tablesetting and a marvelous tribute to so many great bloggers! Hello Bill, It has been so busy at our home this year entertaining family and friends from across the pond that blogging has very reluctantly been put on hold for now, but I have been having a peek now and then lol. One of the things we miss the most about England are all the hilarious sitcoms. I have to say that upon seeing this Hyacinth would be absolutely gob-smacked and speechless haha that would be a first :-). I take my pink hat off to you sweetie, as you have out done yourself this time. Be still my little heart. I so love this post. What a beautiful table you have set, and what wonderful companions you have chosen. It is ashame we could not have everyone there. Gosh we would have to rent a castle, and I am not sure you would have enough Royal Dalton to go around. Bill sweetie, I will never look at a rosebud again without thinking of you, cupping the little partially opened buds in your hands, and blowing on the petals, giving them a little tug to open them prematurely for this special occasion. You should be wearing a crown at the other end of the table. One fit for a King. The King of Affordable Accoutrements. Happy Thanksgiving and thank you again from the bottom of my heart. What a great post! Beautiful table setting! Hope you have a Very Happy Thanksgiving!! BILL, ABSOLUTELY GORGEOUS,but what else would we expect from you.....I need to come to Jackson and follow you around to these estate sales. If my area had and estate sale it is farm equipment and a few old dishes. Hope this is the best Thanksgiving ever. I am thankful for all the kind and generous people here in blogland. Wow! Just when I think you can't do anything any more amazing....you do! This is....well I can't eve think of a word for it. I can just imagine such a wonderful table set with all these wonderful bloggers invited --- you should do touring estate sales -- I'm sure all of us would love for you to come to our towns and take us on a shopping trip -- so that our tables could be as elegantly set as yours! I'm so glad that you're a part of TT -- I always jump to see what you're going to come up with next -- Happy Thanksgiving! Bill, How delightful to find that you are a fan of that show. I love Mrs. Bucket, too. She is just like an aunt of mine - full of airs! I love your table and that Royal Doulton china. It is just beautiful and as always your table scape belongs in a magazine. You have Eddie Ross beat by a mile. I could just look and look at your tables, and usually do. I have sent many friends and relatives to see your site and everyone loves it as much as I do. Thank you so much for adding this beauty to the blogging world. wow, very elegant. i love your china. Bill, You bring vintage china to an all new height. The table is stunning, and your royal robe and tiara were not wasted on me. When I came to that picture, I let out a loud laugh...it was perfect. You come up with the most gorgeous and interesting tables. I am a big fan! Happy Thanksgiving. I, too, enjoy polishing my silver. My sister & I were fortunate to receive a place setting of sterling flatware for each birthday for 8 yrs. Not many little girls would appreciate that, but my mother made it more special by letting us set the Sunday dinner table with "our silver". When I married, we bought serving pieces & of course, ICED TEA spoons. Every Southern gal should have those as a part of each place setting. Bill, This was just so much fun for me and creative of you. Your sense of style, I now see, is totally outdone by your kindness and and thoughtfullness! The table was perfection, I just love Royal Doulton, and this pattern is so delicate and beautiful. But my first love is... silver! Oh, it is fabulous. The flatware is just over -the-top! This was such a great post- please do this again. I have gotten to know some of these lovely ladies through my short blogging history and you are right, they are royalty of our blogging circle! So.... that must make you the prince! Bill, This is my first visit to your blog and I am blown away! I just spent the last two hours reading every post since inception. Thanks for the inspirations. Happy Thanksgiving. You certainly put a smile on my face..it has been a rough week! Thank you, what a treat !! Bill, you are such a clever guy! Yes, this is a fabulous way to spotlight your tablescaping friends in Blogville. You did this with such elegance and style as you do each time you present a table. The Royal Doulton china, the crystal, the silver, linens, flowers, . . . all delights for the eyes. The royal robe and tiara were the perfect touch for our Susan. What a wonderful tribute to her and the others. We are definitely blessed with the friends we've made through these Thursday Tables. Bill, this is absolutely stunning. You have so many beautiful things, and you just have the gift for setting an absolutely jaw dropping table, EVERY time! Your pictures are getting better and better too! Thanks for sharing, and have a great day! Happy Holidays! Happy Thanksgiving, what a party with a fabulous guest list. The china pattern is delightful and a lovely addition to your themeing. I absolutely love your tablescapes. I search you out each week to see what a new and fantastic job you do. Marvelous tables each and every time. What a wonderful way to give thanks to your fellow bolggers by inviting them all to dine with you. I don't have a blog and don't think I would have anything to add to blogville. I guess you'd say I'm a lurker. I do enjoy everyone's tablescapes and I do have a dish fetish with 16 complete sets of dinnerware. Maybe some day. Bill, okay...I try to stop by everyone of your tablescapes because they are so gorgeous and creative everytime! But this time you really created one of your best. Besides the absolutely beautiful table setting, which was made possible by Estate sales, (which I am a great fan of! ), you created another fun way to virtually share your table with fellow bloggers. Bravo! Happy Thanksgiving! Bill, you are a hoot. Such a marvalous setting! Hands down the most elegant! You certainly have an eye! The flatware is stunning and such a good choice. I loved this! You always make your posts so entertaining and/or so endearing. I love how you tell a little story all the time, it's like reading a book you never want to finish. The photographs are outstanding! I especially loved the shot of the silver pitcher and the silverware on the napkin in the first few pictures. And I so admire your attention to detail, the little rose place card holders match so perfect with the silverware. And the royal garb draped perfectly over the chair and spilling over to the floor, the robe alone looked like royalty! And the tiaras! Beautiful detailed perfection! I can't decide if I like daylight or candlelit pictures best, I usually love the candlelight but I think for this particular post I like the day light best. I love your marble-topped piece in the dining room. It's really beautiful! And, thank you, Bill, for always being so kind and generous to me in your comments. 'Hope you enjoyed a wonderful, Blessed Thanksgiving! This is a magnificent tablescape, and each time I visit I continue to be dazzled by your creative talent. Congratulations on being awarded a Blog of Note, you most certainly deserve it, and have my vote! What always impresses me is how you consistently show original work, which is much more time consuming to produce. I wondered how you had acquired so many lovely, beautiful objects to work with, so appreciated your post explaining this. You are someone I enjoy learning from and gather much inspiration with each visit. I hope you had a nice Thanksgiving, this year we escaped to a lovely inn for some R&R. Have a nice long holiday weekend, and I look forward to seeing what you have in store leading up to Christmas. All my best. Bill -- you always have such wonderful tips -- any suggestions on removing old water spots from glasses -- I picked up some wonderful golets from Goodwill - only to see waterspots when I unpacked them at home -- do you have any "tricks" up your sleeves? The reason I came back is to check out the lighting. I think you have that mastered! I especially like how the candles make the crystal just sparkle!!! I need to get a test site... seems like I am always going back to adjust things... in fact I just now added more pictures to my Thanksgiving tablescape. Such a fun am lovely post, so very special. Hope you had a fanastic thanksgiving! Oops, I guess they are. LOL I have the patience of a 2 year old I think! Sorry about all that. I didn't think the American liked the British humour. I have never watched Hyacinth "Bucket" and I live in the UK, not my sort of thing!! It would take a great Brit to match your table settings, Bill, Buckingham Palace?? I believe there they have to measure each setting, see link:- http://tinyurl.com/BPtable-setting. We will never get invited to a banquet, but we have been to a garden party there last year. Thank you for another amazing tablescape. Your choices were perfect and I think the idea of specific place setting names was great. Very entertaining. I've seen those ladies tables and agree on your choice of guests. Your photography as always shows off your lovely things beautifully. Bill - Keeping Up Appearances is one of my all-time fave shows. I have many of them recorded. Always love your tables. Love your reference to Keeping Up Appearances -- one of my favorite shows! You have such great treasures. I've been gone for the past two weeks and am catching up (I didn't want to spend $$$ for shipboard internet). Hi BIll, Another beautiful tablescape. You make it an art. How funny you also love "The lady of the house" Mrs Bucket. She is so funny and so are the rest of the players. Good show.